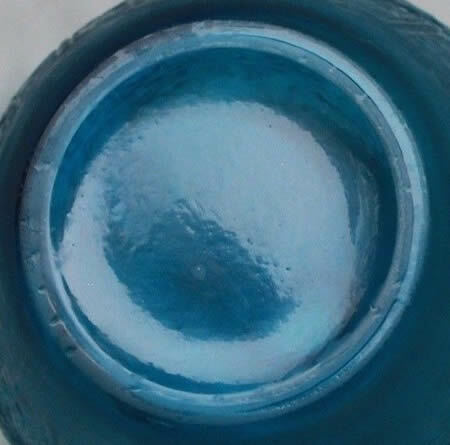 Following up on the Pink Acanthes story from June, appearing on Ebay this month was a blue glass Acanthes vase look-alike that had many of the warning signs. And while questionable items appear on EBay all the time, what got our attention with this particular vase is not just that it sold for $4550 to some really lucky buyer, but that it doesn’t appear to be in the same mold as the pinko vase you’ve heard tell about. Sure they both have unfinished wrong necks. They both have the apparently low mold quality to the design. They both don’t match the literature for authentic pieces, and they both lack the great molded signature you like to see on an authentic Acanthes. But where so many of these propositions fall flattest, is how the base is finished. In the great falling flat contest, the blue one seen here takes the prize. A right minded *** person might think that if all the other signals were missed, that all by itself the bottom of this vase should have the lucky buyer singing the blues. Obviously opinions vary since it’s hard to imagine bidders chasing the vase up over $4000 if they didn’t believe the vase was an authentic R. Lalique vase. So take a look and judge for yourself if this looks like what you’d expect from the underside of an authentic R. Lalique Acanthes Vase or any R. Lalique Vase. And if you don’t know enough to decide for yourself, make it a point to see and handle as much R. Lalique as you can. Get educated and get independent advice on your purchases. Nobody wants to be a penguin, right? One other note about the Ebay listing. The seller never said it was an R. Lalique Acanthes Vase. 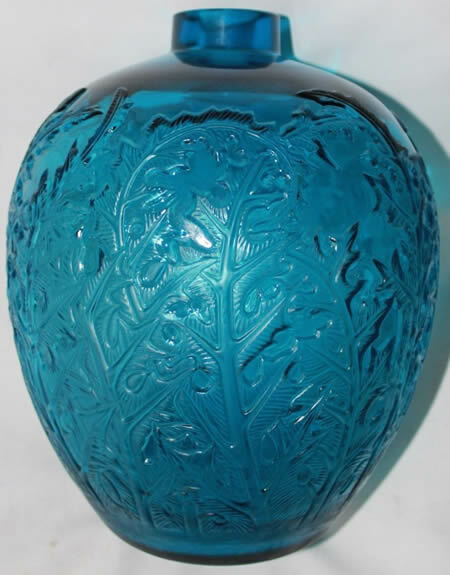 What the seller did do was title the listing: “R Lalique France signed numbered blue colored glass Art Deco vase”. We’ve had sellers including auction houses say with a straight face that all they meant was it was signed as stated, not that it was actually what the signature said. Two words come to mind when hearing that explanation when a seller has left their own purposefully created inference out there without contradiction: Sharp Practice ****. Of course on Ebay in the title to your listings: “Only mention the brand name of the manufacturer that actually produced your item …” ***** Good luck with that in this instance! And this is a good time to repeat our oft pontificated advice: It doesn’t matter what the motive or knowledge of the seller was. It only matters what you know. Maybe the seller just meant to say it was signed as stated. Your job as a collector is to know what’s right and wrong and not rely on the seller. ** Hot on the heels is a phrase that is said to have originated with hunting, capturing the reality of the living warm creature with all living things getting hotter as the pursuers get closer to the pursued. It’s almost the opposite of “the trail went cold” for the same reason. So here it’s used to say that the blue came right after the pink. In this instance the phrase “Hard on the heels of ..” would also be appropriate. *** A right-minded person is in a good mental state… sane, rational, stuff like that. **** A sharp practice is a crafty or deceitful dealing. This entry was posted on Sunday, November 26th, 2017 at 3:17 am	and is filed under R Lalique - Rene Lalique Authentication Identification, R Lalique and Rene Lalique Fakes-Copies-Frauds.